Kingsman: The Secret Service (2014) was my favourite film the year it was released and to see the sequel is really quite exciting. Kingsman: The Golden Circle pick up the story after what happened in the first film. Although it’s not entirely connected, there are some things about the previous film, mentioned in this film. However, if you haven’t watched the first film, not to worry, you can still enjoy and understand this film. But seriously, you should see the first film. Kingsman: The Secret Service is such a great film that I really have high hopes for the sequel. So, let’s talk about it. I like how the film started with action scenes rather than a boring prologue. What I don’t really like how they edit the CGI effect. I don’t know if they chose it that way or the effect turned out to be bad and so computerised. It doesn’t happen one time only because if it’s only once, I’ll let it slide. But since it happened a couple of times, I kind of questioning whether they did it on purpose or not. However, I do like the overall storyline since it’s pretty interesting. I can’t say if I like Kingsman: The Golden Circle more than Kingsman: The Secret Service because I think the first film is better. It’s not like the sequel is bad. I just like the first film more. That’s all. Let’s discuss the actors and the actresses first. Taron Egerton is back again, still as Eggsy. After what’s going on in the first film, Eggsy now has become an official agent of Kingsman with the codename of Galahad. Taron Egerton’s character has become more mature now but still has a touch of a young lad. It’s interesting to see his love story as well. Not too much, but just enough to add some romance to an action film like this. I think Taron Egerton has done a great job in portraying Eggsy, whether when doing the action scenes or just a normal scene. Eggsy got the poised and the naughty side, making him loveable and fun to watch. I like the character of Merlin played by Mark Strong. He is not the main character but always played an important role, an important sidekick. Like his codename, Merlin. The main character is always King Arthur but Merlin is always the helper and a very important one. But in this film, it’s not King Arthur he helped but Kingsman agents. Merlin doesn’t really go to the field to do the spying or some sort, but he always helps his agents from behind. A computer geek. A very very genius computer geek, with a kind heart as well. That’s why his character is interesting and fun to watch. Mark Strong really has portrayed the character of Merlin really well. The comeback of Harry Hart portrayed by Colin Firth is a bit of surprising and not so surprising. I kind of guessing that he would be back, seeing that his character has played a huge role before and Harry Hart is one of the most important characters in the film. If you haven’t watched Kingsman: The Secret Service, I won’t spoil any more hint about why I thought the character of Harry Hart has a chance of not coming back. Harry Hart’s character is a bit different than before but Colin Firth still portrayed it perfectly. I haven’t seen much of Colin Firth’s films but I know he is a great actor. After all, he’s an Oscar-winning actor. With his not-so-young age, Colin Firth still can do action scenes really well. Together with Taron Egerton, their fighting scenes were really exciting and thrilling to watch, though it can be too bloody. Julianne Moore joined the cast as Poppy, the head of the Golden Circle, some sort of drug dealer organisation. She was forced to cast away because she produced narcotics and if she stayed, she would be captured since producing and selling drugs are kind of illegal. Julianne Moore is certainly a great actress that can do any character, including an antagonist. She’s not my favourite actress but I really have to say her great acting skill. I was hoping that Halle Berry and Channing Tatum got more screen time, especially Channing Tatum. Not that I am a fan, but I think his character is interesting. Halle Berry played the character of Ginger, while Channing Tatum played the character of Tequila. Both of them are agents from America’s version of Kingsman agents named Statesman. It’s fun to see them working together with the Kingsman agents. Like Taron Egerton and Colin Firth, Channing Tatum did great in doing his fighting scenes, so did Halle Berry. 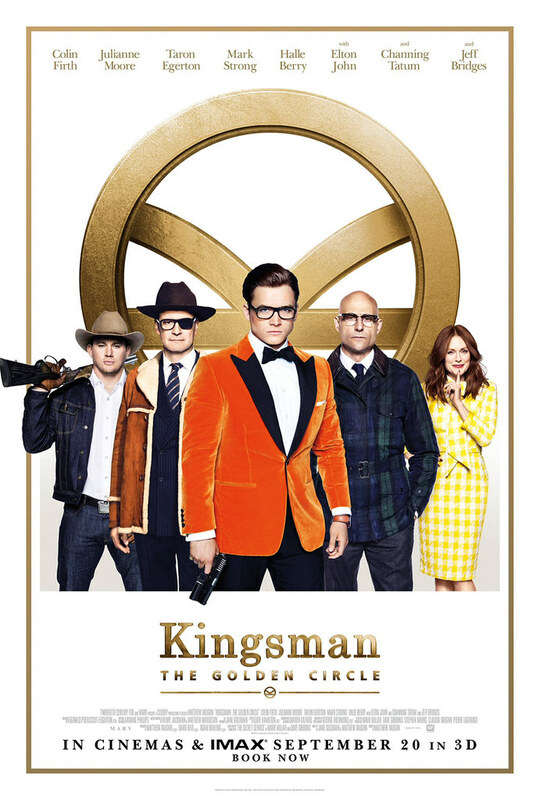 If there’s another sequel for Kingsman films, I would be excited to see them again. Pedro Pascal as agent Whiskey also got my attention. He’s funny in some ways and his fightings scenes are often exciting to see. I used to see Galahad and other Kingsman agents used their umbrellas as weapons but it’s my first time seeing an agent using a whip. It’s interesting to see Michael Gambon joined the cast as Arthur. It’s been awhile since I last saw him, the last being Harry Potter and the Deathly Hallow: Part 2 (2011). Although Michael Gambon didn’t really get a lot of screentime, I think he played the figure of authority really well. What’s funny is the presence of Sir Elton John as himself. The famous musician joined the cast and added some entertainment in the story. Not to mention that his character in the film made us laugh more than a couple of times. Every time he shows up, he’s a scene stealer. And of course, because he played as his own, we could hear his golden voice at some points. The overall story of Kingsman: The Golden Circle is interesting and exciting. It’s still funny and at some points kind of sad as well. The fighting scenes are still bloody and brutal in some ways. And with some bad words also being spoken throughout the film, no wonder this film got an R-rated. I’ve mentioned it before that some scenes were too obvious as a computer made. I don’t know if the filmmaker did it on purpose or it’s just too difficult to make those scenes looked real. Some fightings scenes are too fast that I have to really pull myself together to keep up with the fights. At any rate, the film is still enjoyable to see. Not better than the first film, but just enough to make this film enjoyable. A story of a drug-dealer boss is kind of cliché but they packed it a bit unusual and interesting. How the drugs create chaos in the film is kind of thrilling but at some points a bit funny as well. Ridiculous but a good ridiculous. All in all, I enjoy watching Kingsman: The Golden Circle. It’s a fun film to watch with an interesting story and exciting action scenes. It’s good to see both Galahad together again alongside with other agents as well. Kingsman: The Golden Circle is definitely worth to watch. I give Kingsman: The Golden Circle 8 out of 10 stars.